The gauntlet is down for Billy.. | Through the seasons before us.. The gauntlet is down for Billy.. Right then, we are where we are. It’s time to start thinking about how the club moves forward in the short term. The very best we can hope for is loan signings, which Billy has already said he doesn’t want – he wanted signings, he didn’t get them. Whether it’s fair or not is irrelevant, the gauntlet has been thrown down and now it’s Billy’s job to get the side performing. I don’t really have much of an issue with Billy’s press comments – indeed, in the words of the man himself – don’t believe 90% of what is written about him, and believe less than 50% of what he says. Whilst I am sure, much like me, he’s disappointed to not have some new faces to work with – despite his public protestations about knowing nothing about prospective transfer news, I imagine he was well aware of the state of play. Whilst a lot of support-wrath is being poured upon the board or the transfer-acquisition-panel (not surprisingly), it’s important we don’t lose sight of the person in the club who holds sway over our more immediate fortunes. He has a challenge on his hands with such a compact squad, but that shouldn’t be a carte blanche for underachieving, and I’m sure for a professional such as himself it won’t be. One person’s interpretation of stepping away from the blame is another person’s view that he’s deflecting attention or wrath from his players – Billy is a real Marmite character in the media. Whilst I’m no fan of yeast-extract based spreads – I do like Billy. And I really didn’t at first, I had an uncharacteristically irrational dislike of him upon arrival, but I am concerned that the transfer non-activity is deflecting attention away from on-the-field matters. When we play Chambers at right back (indeed, when we play Gunter at right back too!) he needs to have the support from a midfielder infront of him. Now, with Anderson and McCleary out that makes this somewhat tricky, but the lack of width in our midfield is alarming. It makes the middle congested, it makes it very difficult for the likes of Paul McKenna – clearly unfit and underpar anyway – to find a simple outlet. Of course, whether we should be playing someone – captain or not – who is clearly unfit and underpar is down to the manager’s discretion, I wouldn’t presume to pretend to know more than he does – but what has been clear is that our lack of width in midfield not only stifles our attacks by exacerbating us losing the ball in midfield, it leaves us very vulnerable to our opponents attacking us on the flanks – with the fullbacks often left with a tag-team of opposing winger and full-back facing them. We might be limited on true wingers at the club, but I’m desperate to see them staying on the wings a little to ease our distribution of the ball going forward and give some protection to our fullbacks. I certainly expect a little grizzle at the lack of players from the gaffer – but the challenge is now for him to deliver with the resources he has available – that’s his own description of his role, and I’m sure that’s what he has in mind irrespective of media comments. 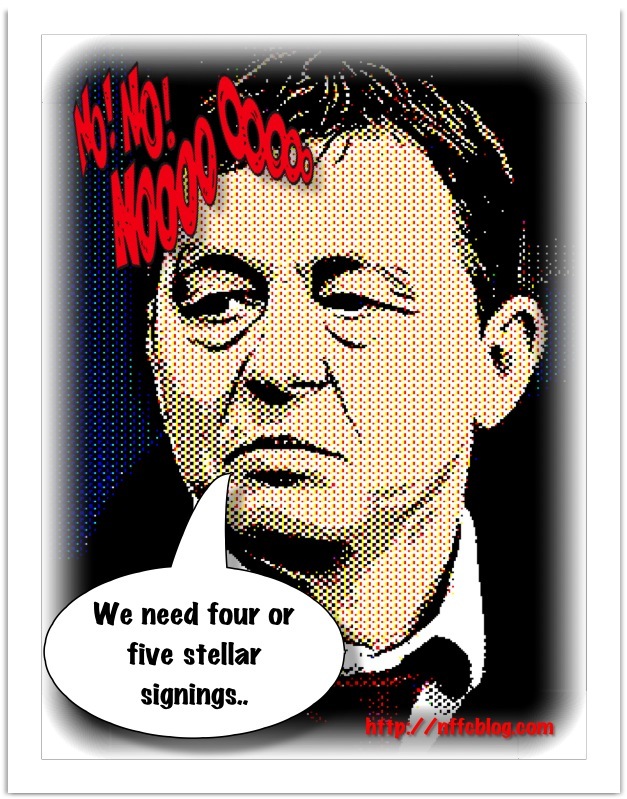 Whilst many are smarting over the powers-that-be not delivering the signings we crave – now is the time for Billy to step up to the plate and justify his reputation as one of the best managers at this level. I’m sure he’d read my views on some of our tactical frailties and laugh them off, which is fair enough – he knows more than me – but I really hope that the lack of signings isn’t picked up as an automatic excuse for not playing as well as we might. seriously, how can you not like Marmite! Seriously tho a damn good article NFFC but the way Billy has played it, I feel now he has the perfect excuse should Forest fail to deliver the goods. I can already hear ” I told you so” ringing out from all corners of the media. But yes you are right…. its time to roll sleeves up and get on with it. Don’t forget the free agents……….See following link.. I do worry how long Billy will be with us now, I don’t think it will be long. Let’s hope we loan some quality with an option to buy. I think that what Billy will do next is the big question. I wouldn’t be a bit surprised if he decided to walk. It is clear he has no influence within the Club and for a person with a character like Billy’s that is something he may not tolerate for much longer. The problem is quite simple. It doesn’t matter what Mark Arthur, Billy Davies, the AP, the players or the Fans say or think. The only person that that has any influence at all hardly ever speaks and when he does its difficult to belive what he says. That man, yes you’ve guessed it!! Nigel Doughty. Now I’ve always defended Doughty. He came along and rescued the Club then pumped a hell of a lot of his own money into it, however there comes a time when we need to be told the truth about what is happening. After the Play off defaet last season Doughty was interviewed and said that over the summer we would be bringing in ‘at least 2 or 3 players’ to make the next step. Nigel what happened? Was it a lie? If not come out and tell us, if the money isn’t there tell us, if you do not want to spend it tell us. Don’t hide behind the AP (they only act on what you tell them to). I like many others will be there against Millwall and will allways follow the Reds but I just wish the Club (which is Nigel Doughty) had the decency to be honest with us. Above all tell us what is happening and tell us the truth!!!! I fear Billy will walk now. I don’t like his attitude or internal belief that Billy comes first over Nottingham Forest. Doughty said, no more mediocrity, no more average players at Forest. Protest against the board being set up outside the city ground, on saturday before the Millwall game, have a look, and join if you want to attend. We have power in numbers, we have a voice so lets use it!! Would need to know a little more about the nature and aims of any protest before commenting further. Is it just going to be people shuffling around the carpark with no real sense or why they are there – does the movement have any specific aims for its’ actions? so if marmite became a new shirt sponsor, would you be able to bring yourself to buy a new kit? NFFC- If marmite became our new shirt sponsor, would you be able to wear the kit? Haha! Well since not only we’re subject to two new kits every season, and since we no longer get any discount from the club shop for being season ticket holders, I wouldn’t buy a new kit irrespective of who our sponsor is! i’ve not bought a new kit for ages as it was a bad omen- every time i bought one we got relegated…. Great to see a bit humour in amongst our hour of discontent.Agree with the width issue nffc it makes us so predictable if we dont have it and such a force when we utilise it. well. Im not a fan of marmite but a bif fan of our current manager given the right resources we WILL BE PROMOTED.Tie his hands and i think it will end in tears for all concerned hes too fiesty. I cant see our support rising up against the board even if there is a protest .It will come from the stands as smoulderwood found out. What do I do if I’m billy? No need to resign (and lose my livelihood), but the Board know that even if we are doing well January is truly the last chance saloon. In the meantime, if any jobs elsewhere come up where there is decent financial backing – you wont see me for dust. I’ll get them to pay off my contract, and I’ll have the last laugh over the AP. I hope I’m proved wrong. But remember Billy has the scars from not being backed in squad strengthening at the sheep and he wont be willing for history to repeat itself. Bring your Doughty out banners to the Millwall game. For far too long the fans have been taken for mugs. 11 years of failiure Mr Doughty, do the decent thing, sell up now and get out of our club ! If you have not already done so,check out wwwfreeforest.co.uk click the first link,the ND years ok its a few years old now but things have not got better……….. I thought that site came to be when we were in League One… you must have a short memory, but I could’ve sworn we finished third last season in the Championship! I don’t think ND is beyond criticism, but can’t back a campaign with no clear aim – without knowing who is in the frame to take over it seems a bit of a waste of energy. I feel the same way,but things have got to change its crazy that this club wont or cant attract players,i am sure ND made a statement 3 or 4 weeks ago saying the 19 or so players we have could cope with life in the prem,is he watching the same team as us……..not very often me thinks. I think this may all be a manifestation of some deeper malaise in football. The feeling I get is that we can attract the players but cannot (or choose not to) afford the wages they are asking / transfer fees. ND has put his hand in his pocket on numerous occasions, with varying degrees of success, but the fact remains he has a pocket to dip into. Is the aim of this campaign to tell him to make better decisions or get out of the club altogether? A knee jerk reaction with no thought behind it. If he goes who comes in? I can’t see a big line of oil sheiks or Russian oligarchs rushing to buy Forest, because whether we like it or not, we’re not famous anymore. We haven’t been in the Premiership since 1999, and in the new Sky era of football history that is all that counts. This squad is near as damn the one that finished third last season. So how about Billy does what a manager is supposed to do. Coach the players to make them better, play them in their best position, get them fit and employ tactics that work. (Not booting the ball up to those well known target men Earnshaw and Blackstock). Doughty saved the club, and pumps his own money in. He hasn’t come in and landed us in debt. Tell me who else is going to do that. Until then shut up and support the team. Mr Newton is it not possible to support the team and put your veiw,ND gladley tells us what he puts into the club but fails to tell us what is taken out,apart from getting BD in the running of this club on the playing side has been shite(my veiw),but then again thats all i want come 3pm on saturday afternoon,as a footballing man proven in this div, if BD tells you what is needed have a bit of faith in the man and within reason give him a hand ,dont put to much faith in ex cricket man Mark Arthur and Mr Pleat. If putting your view is negative I don’t see how it helps Forest. Wanting Doughty out as an end in itself is pointless unless there is an alternative. Who do the Doughty out brigade want in his place? I am not aware of a queue of buyers with bottomless pockets waiting to buy the club. I think the boared are being very negative in not backing the manager,that also does not help Forest………. The worst part of the recent saga is lack of info from the club! At least ND is a supporter and put a lot into the club but we need to know the facts about attempts to bring in players. Its easy for BD to blaim the AP but it seemed obvious at an early stage that their present clubs weren’t going to sell Pratley and Whittingham. In the championship and getting players good enough for the premiership is not easy but Billy’s a scot. Arn’t there ant good players in scotland who would come south – clubs up there are desperately short of money! NFFC make a statement! It appears the club have had the thousands of people’s pants down who bought season tickets – would so many have purchased or renewed if they’d have know that we would only sell and not add to the squad? NOT ON YOUR NELLIE would they! Just look at the clowns he’s employed? has he ever come out and said sorry for his mistake (s)??? nope! it’s the exact same scenario as when Paul Hart got us to the play-offs , instead of adding to what was already a talented squad , he began dismantleing it -madness!! Do we as fans deserve this? No , Have we suffered enough of watching dross over the past 7/8 years Yes! I just hope all this isn’t papered over by the possability of a couple of Loan rejects that’ll probably come in and do a job for a few months , what then? and lets not forget that Bertrand is only here for 6 months , what then? we could face another Shorey scenario. Nottingham Forest must be an attractive propersistion to any possible buyer , wouldn’t it? Why should us as fans settle for second best? Doughty , i urge you to put your hand in your pocket or sell up….. oh and take that pillock Arthur with you! I wasn’t aware that Nigel Doughty dismantled Paul Hart’s squad. I seem to remember just as many rumours suggesting that it was Hart’s decision to not offer new terms to Brennan, Scimeca, Lester and Huckerby, and Hart’s decision to sell Harewood but buy Taylor and King. But I stress, these are rumours – just like the conjecture that it was down to Doughty not backing the manager and it is Doughty trying to undermine Billy at the moment. When someone can tell me some facts, then I will start paying attention again. Just a point to all those who say we have virtually the same squad that finished 3rd last season. Yes we have, however after the transfer window shut in January we started to struggle. A paper thin squad and injuries meant that we went from having a real chance of finishing first or second to struggling to get third. This was followed by the play off disaster. Newcastle & West Brom strenghened – we didn’t!! Our squad has been depleted over the summer therefore it stands to reason that it is not nearly good enough to challenge this time round. Up to Christmas last year the team played with a confidence & belief, I’m sure I’m not the only person to notice its abscence so far this year. If I was a Forest player I wouldn’t play with confidence or belief. Afterall the manager spends all his time telling the world the squad he has isn’t good enough, is too young, not fit enough. If Billy thinks they are not good enough, why should they. Billy is the best manager Forest have had since Hart, I just wish he would shut up and do his job. I’M NOT ON FACE BOOK BUT THE MRS. IS……CHECK OUT NIGEL DOUGHTY’S PROFILE …ALSO CHECK OUT THE NIGEL DOUGHTY OUT FACE BOOK CAMPAIGN….HILARIOUS OR WHAT !!!!!! Please don’t spam multiple stories with the same comment. I don’t think I’ll bother looking at these Facebook morsels. Don’t like Doughty, never have, but we’re lucky to have him. Why EXACTLY are we lucky to have him? I’m not buying into the fact that Nottingham Forest would have gone bust without HIM… Someone would have bought the club, they always do… look at Southmpton , Portsmouth , Notts etc etc – the list is endless. The fact of the matter is , we have achieved absolutley nothing under Mr Doughty’s ownership , apart from the embarrasment of League One football. Ok, we reached the lofty heights of 3rd last season but that was more down to the manager and luck with injuries, we were desperately short of numbers last season , we should have added to the squad during the January window like Newcastle & West Brom but Noooooo the powers that be thought that the squad could still do it , even though every fan sat inside the City Ground could see we needed new blood to try and help us over the line.. If Mr Doughty is not prepared to put his hand in his pocket then put thr club up for Sale , someone WILL buy us! Whoever buys us cannot do any worse in holding the club back. heard from a good source that robbie keane is coming on loan !!!!! !